Conventional wisdom tells us that everything gets more expensive over time and there’s nothing we can do about it. That’s not the case. If you feel like your paycheck has evaporated after you’ve paid your cellphone bill, car insurance, the utilities, and the cable bill, here’s a bill-by-bill guide to lowering your monthly expenses and keeping more cash in your pocket. For most of us, following a few simple tips and practicing a little customer service savvy can save a lot of money every month without sacrificing your lifestyle to do it. Below, I’ve laid out a guide to doing just that with each of your monthly bills. You can tackle the entire guide as a whole, or, if you have one bill in particular that’s putting an unjustifiable drain on your pocket, just click on that bill in the table of contents below. Photo by Brendan Wood. We’ve discussed a number of ways to save money on your wireless bill before, but now that many wireless carriers have introduced data caps and new plans, it’s worth going over some of your money-saving options. Photo by eyeliam. Make Sure You’re On The Right Plan: There are plenty of ways to keep track of your mobile data usage, and with more carriers adding caps to their data plans than ever, now is a good time to get in touch with how much you actually use. If you have an Android device, My Data Manager is a utility we like to get your arms around the amount of data you use. iPhone users can get the same effect with My Data Usage, another app we’ve mentioned. Once you have a handle on how much data you actually use, odds are that you’re shy of the data cap you may be paying for. Many wireless carriers direct tech-savvy users, or at least users who say they want to stream music, surf the web, and get their email to the highest possible data plan. If your plan allows you 10GB of data per month and you find you’re only using 1.5GB (like I did,) scale back to a cheaper plan. You could save dozens of dollars each month if you do. Finally, check with your wireless carrier to see if there are new voice, data, and texting plans that meet your needs or are equal to the one you have for less money. Verizon Wireless, for example, ran an “America’s Choice” and a “Nationwide” plan at the same time with different prices for similar features. Make sure you’re on the best plan your carrier offers that meets your needs. Use Google Voice: We love Google Voice, not just because it’s easy and offers features your phone company doesn’t want to provide, but also because it saves you money. We’ve talked about how to make unlimited free calls with Google Voice by adding your Google Voice number to your “Friends and Family” or “My Circle” plan, depending on your carrier. You can also use Google Voice to send text messages and ditch your carrier’s texting plan entirely. Plus, with your Google Voice account and forwarding set up to your landline or office number, you can make free VoIP calls to anyone, and put down your cell phone for a while. 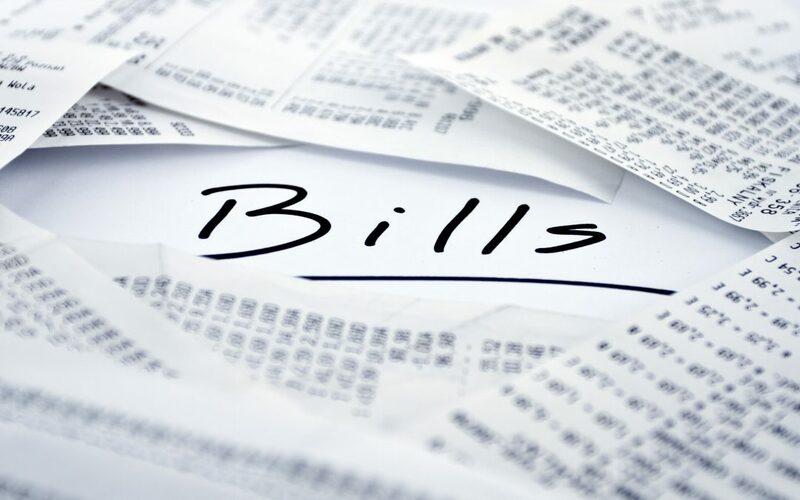 For many, especially those of us who have a lot of technology at home or work from home often, the power, cooling, and heating bills are the biggest monthly expenses we have. Saving money on your electric or gas bill doesn’t mean you have to give up your gear and live in a shack: Lifehacker’s Jason Chen managed to cut his power bill by a third without giving up his quality of life at all, and you can too. His guide is a must-read if you really want to save more on your energy costs, but for a quicker primer, here are some important tips to remember: Photo by Steve Ryan. Use The Thermostat: We’ve argued for programmable models and against them in the past, but whatever model you have, make sure to use it. Even bumping the thermostat up a few degrees in the summer and down a few in the winter can save a ton of cash on your heating and cooling bills. EnergySavers.gov says that you can get 1% of your total heating and cooling cost back per degree changed, as long as that change lasts for eight hours or more. So put on a sweater and pour a cold glass of water, program the thermostat, and when you start sweating remember it’ll all be worth it when the bill comes in. Banish Vampire Power: Unplug your standby devices and chargers when they’re not in use. Better yet, put them all on the same power strip so you can turn them all off with the press of a single button without fishing them out from the wall. Alternatively, you could look into some of the power strips we’ve mentioned before that will automatically cut off power to your standby devices for you. If you don’t think this can save you much money, you’d be surprised: depending on what you leave in standby mode, it can cost you more than you might think. This goes without saying, and it’s been mentioned several times before, but if your computer, lights, appliances, or other electronic equipment isn’t in use, turn it off. Don’t settle for standby, turn it off entirely. Run Your Dishwasher/Washer/Dryer Full and at Off-Peak Hours: This one’s something that most people have known for a long time, but it can still save you energy and money. Running the dishwasher, washer, or dryer only when there’s a full load ensures they’re operating at their most efficient and you don’t wind up trying to cool your house because the dryer or dishwasher are running hot (instead, you’ll be asleep.) Similarly, if your utility company charges lower rates for off-peak energy usage, you can take advantage of them by using those energy guzzling appliances at night. Switch to Energy Efficient Light Bulbs: Jason Chen mentioned this in his guide, but it bears repeating: switching to Energy Star certified compact fluorescents can save you a good bit of cash on your energy bills, and even more for each additional bulb you change from a standard incandescent. Some of the best ways to get a deal on your cable or satellite bill are the easiest ones. Here are a few ways to convince your cable, fiber, or satellite company to cut you a break on your internet access charges or your television subscriptions. Photo by Bryan Brenneman. Change or Downgrade Plans: Do you really need all of the premium channels, or are you paying for premium content that you’re actually not using? Cable and satellite companies purposefully obfuscate how your experience will change when you step from one tier to another, and the only way to cut through it is to contact them and ask. One tip: call and pose as someone looking to upgrade or buy new service, and ask them to help you understand what the difference in plans means for actual channels. Ask For It: Sometimes all you have to do is ask nicely, and a customer service representative will give you a lower rate. When Comcast sent me a notice saying they would need to increase my monthly rate by $15/month, I called to downgrade my plan. The rep I spoke with asked me how much I was paying now, and told me to name my own price. I didn’t just walk away free of the increase, but I got a promotional rate for three months, after which the bill went up to the rate I had before. Sometimes the secret is to ask to speak to your cable or internet provider’s “customer retention” department. Your mileage may vary, but it’s usually this group’s job to make sure you stay a paying customer, and they have broad powers to make sure that’s the case. A bump down to a promotional rate is usually the least they can do. Many of us, especially renters, don’t need to worry about water and sewer charges, because they may be parceled out by your management company or included in the lease. For those who do pay a water bill, or who want to make sure to save as much water as possible, here are a few ways to keep your money from going down the drain: (see what I did there?) Photo by Kevin Marsh. Install Low-Flow Toilets and Fixtures: This one won’t win over the folks (like me) who prefer high water-pressure in the shower, but a low-flow toilet, showerhead, or garden hose can save water and money on your monthly bills. Low-flow appliances got a bad reputation when they were first introduced because many users found they used more water trying to flush toilets or get good clean showers, but their quality has improved dramatically over the years. The National Resources Defense Council has an excellent guide to case studies where businesses and rental communities installed low-flow fixtures and saved a ton of money, as does the Tuscon Green Times. There’s no reason you can’t do the same if you’re a homeowner. Check for Leaks: One of the best ways to make sure you’re not wasting water is to make sure your plumbing isn’t wasting it even when all the faucets are closed. Check under your sinks and behind your toilets for water damage and leaks. Even small leaks can add up to a lot of money over the course of a year. Hack Your Toilet: If you’re up for a weekend project, you can buy a retrofit kit to turn your standard toilet into a water – and money – saving dual-flush model. If you’re not interested in that much work, use the old water displacement trick to turn any toilet into a low-flow one: fill up a half-gallon jug with water, cap it, and put it in the toilet tank. Take Navy Showers: Jump in, get wet, turn off the water. Soap up and clean yourself off, then turn the shower back on to rinse. It’s a simple way to use very little water and still get clean – but if your morning shower is a refreshing, relaxing start to your morning, you’ll hate this approach. Most of us have credit cards, and most of us have a standing balance on one or more of them. Credit cards are, for most Americans, one of the single largest long-term money sinks that don’t actually appreciate in value the way a mortgage on a home does, or a student loans does on your earning potential. While it’s difficult to save on balances, here are some ways to cut your interest rate. Photo by Images of Money. Find a lower-interest credit card, or one with rewards: Mint, one of our favorite financial management services, can also help you find a low-interest credit card. If you have your banking and credit accounts in Mint already, the service will even tell you how much you would save by switching your balances over to that card. Also, even if you’re in it for the low-interest, it’s worth looking into a good rewards card that offers perks that may actually save you money on regular purchases. Here are some of your favorite rewards cards. Once you have one though, make sure to read the agreement carefully so you don’t wind up paying for anything you could get for free. Transfer balances to a lower-interest card: If you have a standing balance on a high-interest card and no balance on a low-interest card, or even if you can get a low-interest card to transfer your balance to, you could save thousands of dollars in interest by shifting that balance to a lower-interest card while you pay it off. You’ll usually have to pay a small fee to do the balance transfer, but many credit card companies waive that fee, especially for new customers or customers who have been with them for a long time. Call and Ask: Credit cards are another type of bill where it pays to just get on the phone one day, talk to a customer service representative, and let them know you’ve been a paying customer for a long time and you’d really appreciate a break on your interestr rate. In some cases, they’ll grant your wish, dropping your rate a few points. In other cases, even if they say no, let them know you’re planning a balance transfer to a low interest card with their competitor. They’ll usually turn around, and if not, make good on the threat. Not every bill comes in an envelope every month. Some services and charge aren’t quite so regular. That doesn’t mean you can’t save some dough when it comes time to pay up for your car insurance or gaming habits. Photo by Andrew Steinmetz. Insurance: Even if you have a car insurance company that you love or a health insurance provider that you tolerate, it’s a smart idea to shop around and make sure you’re getting the best possible rate for the type of driver you are. For car insurance, there’s simply too much competition in the market for you to not be able to get a better deal just by offering to move to a new company, assuming they can offer the same level of protection you already have. Similarly, if you do find another insurance provider offering a lower rate, odds are your current provider is willing to meet it in order to keep your business. While you’re on the phone with them, see if they’ll toss in a deal on renter’s insurance, or if you can save some money by combining policies. If you lease a property, you should have it, and it often costs insurance companies so little to provide they’ll toss it in for free. By the way, did you know Mint can also help you find affordable auto insurance? For health insurance, look into previously mentioned Simplee to get your arms around your health care costs. If you buy your own insurance or have a compatible plan, Simplee can use your medical history to help you find a better deal. Netflix/Blockbuster/Vudu/Amazon Instant Video: Yes, you can save money on your cable or satellite bill by switching to a streaming video service. Many of you have, but you can also save some money by pitting streaming video services against one another to find the one with the catalog you like the most and the lowest prices. Even with Netflix‘s incoming price hikes, Netflix is still cheaper than most cable television packages, but its streaming competition, like Blockbuster, Vudu, and Amazon Instant Video may offer affordable alternatives depending on whether you prefer to watch DVDs or Blu-ray discs or just want to stream video. If there’s ever been a time to compare plans and see if you can get a bargain, it’s now. Gaming: If you play a subscription-based massively-multiplayer game and pay every month for the privilege to do so, odds are the company you’re paying will offer you a lower per-month rate if you sign up to be billed for several months at once. So instead of paying $14.99/month, change your plan to be billed every three months and you’ll usually get charged $38.99 every three months, or the equivalent of $12.99. Tired of paying to play at all? The free-to-play game market is heating up, and there are plenty of rich multiplayer titles available that let you play for free and only pay when there’s something you want to do. Alternatively, subscribe to a service like GameFly or OnLive for your gaming needs. GameFly is like Netflix for video games, where you pay a monthly fee to have games shipped to you that you want to play. Just like with Netflix, you can keep them as long as you like. OnLive is a game streaming service where you pay for a subscription and a set-top box connected to your TV and the internet. Choose the games you want to play, and they’re streamed right to you. We can’t stress enough how much you can save a lot of money in many cases just by asking. More businesses than you may think are interested in keeping customers and will offer you discounts to make sure you stay with them. If you encounter someone who doesn’t seem to feel that way, call back until you find someone who does. In the worst case, think about whether the service you’re paying for actually enriches your life, and if it doesn’t, let it go. You’ll probably be happier with the money you’ve saved. Take the time to look at how and where you spend your money, and you’ll likely find things that you thought you wouldn’t be able to negotiate prices on that you’re actually very able to get a break over. Whether it’s your favorite video game or your electric bill, there are opportunities to put more of the money you see going out the door every month back into your pocket, or better yet invested into your future. Are there monthly bills that you wish you could lower or be rid of that we didn’t cover here.